Dr. Vanessa Adolf is a 1997 graduate of Temple University School of Dentistry and a member of The American Dental Association, The Pennsylvania Dental Association, and The Academy of General Dentistry. 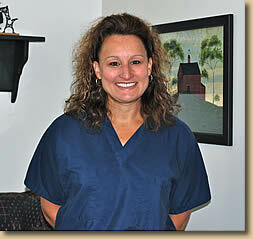 Like Dr. Cohen, Dr. Adolf strongly believes in expanding her knowledge through continuing education. She has taken courses in all areas of dentistry including implants, periodontal therapy, and advanced restorative procedures. While in Dental school, Dr. Adolf was both in the Esthetic Honor Society and the Stomatognathic Honor Society. In addition to receiving Dean’s List recognition numerous times, Dr. Adolf received the "Outstanding Achievement in Operative Dentistry Award" at graduation. Prior to becoming part of the Limerick Dental Care family in January 2000, Dr. Adolf was an associate at a practice in Springfield, PA. In 2001, she became a partner at Limerick Dental Care and in 2007, purchased the remaining interest in the practice from Dr. Cohen. Dr. Adolf graduated from Bishop Conwell High School in Levittown, PA and earned her Bachelor of Science degree in 1993 from the College of New Jersey in Ewing, NJ. Her interests outside of dentistry include cooking, biking, traveling, Phillies baseball, and spending time with her family and friends.